L&T Infotech has been a front runner in the race to acquire a 20.4 percent stake in Mindtree. Reports suggest LTI is willing to offer close to Rs 975 a share to acquire this 20 percent. This pegs the value of this stake, owned by VG Siddhartha, the Founder of Coffee Day Enterprises that operates the Café Coffee Day chain of cafes, at roughly Rs 3,400 crore. According to Chirajeet Sengupta, Partner, Everest Group, “L&T Infotech (LTI) has been on a very strong growth path over the last few quarters. They have been growing significantly better than their peers.” To sustain this growth path, the company has been making investments to grow inorganically. “If you look at the last few quarters, they have made some very interesting acquisitions,” Sengupta pointed out. DXC Technology yesterday announced its acquisition of Luxoft, a global-scale digital innovator with world-class digital talent. I think this is an interesting acquisition, not only from a services industry perspective but also from the perspective of benefits to enterprise customers undertaking digital transformation. The adage, “Disruption does not discriminate,” rang true again with Office Depot’s acquisition of CompuCom last week. The beleaguered office supplies retailer bought the IT infrastructure firm for US$ 1 billion, illustrating yet again the disruptive impact of Amazon and the digital economy. With this deal, Office Depot expects to add US$1.1 billion in revenue, and achieve cost synergies to the tune of US$40 million in two years. As part of the transaction, Thomas H. Lee Partners LP, the PE firm that owns CompuCom, will assume an 8 percent ownership in Office Depot. The deal comes at a time when Office Depot’s business is in the doldrums due to diminishing demand for traditional office supplies as offices go digital and online retailers eat into brick and mortar sales. CompuCom had its own share of problems, with four CEOs in the past four years, declining revenue, and diminishing investor confidence. As the proposed takeover by Staples fell at the antitrust altar last year, Office Depot had been looking for ways to strengthen sales that had continued to slacken for several quarters. Its hiring of a slew of tech executives indicated that a drastic change was in the cards. Synergies around the SMB market: Both companies target this highly fragmented market, with Office Depot’s omni-channel strategy offering access to nearly 6 million SMBs. Uninspiring investor confidence: Office Depot’s share price dropped by 15 percent following the announcement. 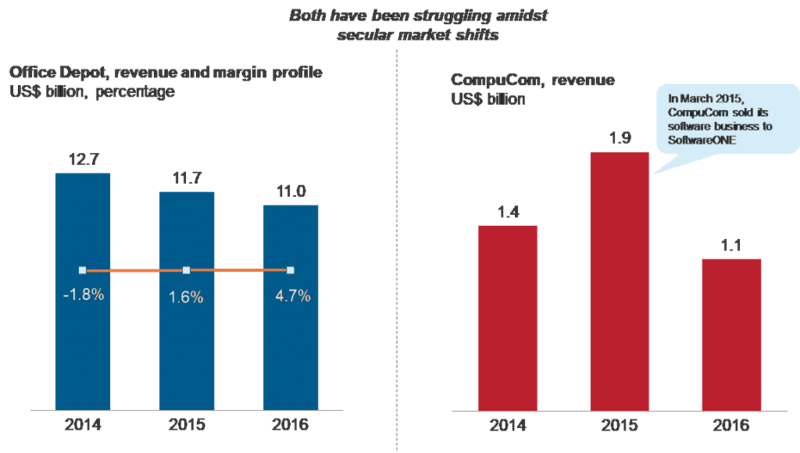 Although this can be considered a short-term consequence, both firms have struggled as secular market trends reshape their core industries. Will the combined entity realize its promised value? Customer education: The combined entity must educate customers about its new value proposition and what it means for their business and their business as usual to assuage any concerns that lead to customer flight. There have been previous instances of retailers acquiring Managed Service Providers (MSPs) to enhance their value proposition and margins. This includes Staples’ acquisition of Thrive Networks in 2007, and Best Buy’s acquisition of mindSHIFT in 2011. Although worthy pursuits, these acquisitions failed due to executional fallacies, lack of a clear-cut strategy, and their erroneous belief that SMBs would choose them to outsource their IT in a managed services model. On the other hand, most of CompuCom’s revenue comes from conventional project-based and procurement engagements. The customer experience point is important here. If Office Depot can make this model a de facto choice for customers looking for a better customer experience, this might just work. That said, the continuous disruption by players such as Amazon and the proliferation of digital users who demand a personalized user experience across all channels will play a key role in determining the success of this acquisition. Creating a definitive digital value proposition aligned to customer expectations and chalking out a clear, dynamic execution strategy are the key tenets Office Depot must embrace for the CompuCom acquisition to succeed. Indeed, they are our words to the wise for any service-related organizations considering M&A activity in today’s digitally-disrupted environment.